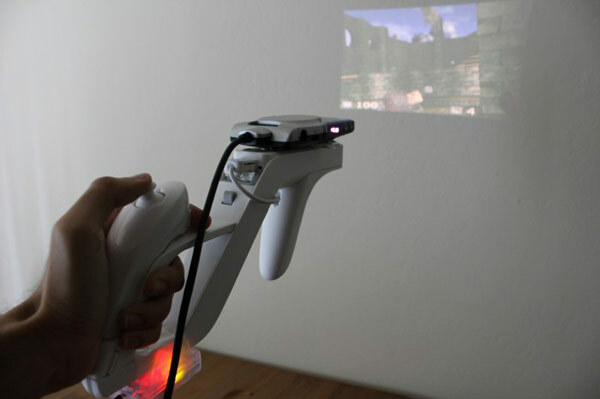 Gamer Nirav Patel decided to make FPS gaming slightly more interesting using a projector strapped to a Wii-gun, he used a handheld ShowWX laser projector and a gyro-meter which combined displays the game wherever he point the Wii-Gun. As you can see in the video it doesn’t look like the easiest way to play a game, but it certainly looks interesting. By combining the stable positioning of the SpacePoint Fusion with the always in focus Microvision SHOWWX picoprojector, one can create a pretty convincing glasses-free virtual reality setup in any smallish dark room, like the bedroom in my Bay Area apartment. You can find out more details about this fun gaming mode over at eclecticc.